This quote from Sangharakshita’s What is the Sangha? expresses its central message. But what does it mean to be an individual? And how are we to sustain, indeed develop, our individuality, and at the same time live in cooperation and harmony with others? Here I explore these questions, with Sangharakshita as our guide. In order to understand what the Sangha really means, we must therefore first understand what it means to be an individual, and one aspect of Sangharakshita’s definition of the individual is someone who is prepared to grow and change; someone who is willing to let go of any fixed idea of themselves. A true individual, in Sangharakshita’s view, is someone who commits themselves wholeheartedly to the process of individual development. Notice Sangharakshita’s emphasis on our connection, not only with those in our immediate Sangha or our local Buddhist community but with all life. The Sangha is not a self-serving institution but one which must consistently engage with the outside world to ensure that the conditions in which we all live are conducive to the development of our own individual (and infinite) potential. 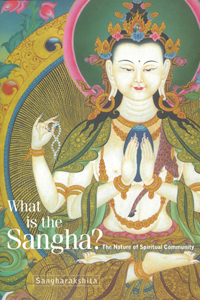 What is the Sangha? touches on many aspects of spiritual community – its place in human history, the traditional Sangha in Buddhist Asia, how to be a Buddhist parent, the place of the teacher – but it is the theme of self-development in association with others that Sangharakshita keeps returning to. Ultimately, ‘this is what the Sangha is really for’, Sangharakshita writes; ‘this is what the Sangha really is’.